I know this is a wonky thing, but I was reading the Library of Congress blog this week when I saw an article about the centennial of copyright for film works. Prior to that date, film was not on the list of classes of work that were eligible. 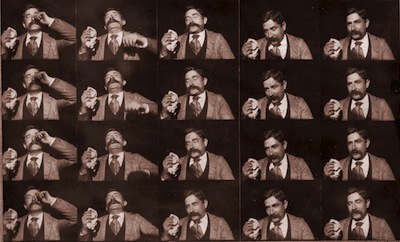 Filmmakers would instead send in collections of stills from the film, because photographs had already been eligible since 1865, like this series from 1894 of a man named Fred Ott sneezing in an Edison Kinetoscope movie. By the way, I love that this is what movies used to be. At the urging of the movie industry, the amendment also limited statutory damages that could be awarded against movie studios for innocent infringement of nondramatic works. How things change. Today’s movie industry, of course, has been one of the largest institutional supporters of insane levels of statutory damages, even filing a brief in support of the RIAA and a $1.92 million fine against a p2p song downloader. The tragedy, of course, is that the content industry’s addiction to expanding copyright scope has caused it to discard its own history. And that’s our cultural history, too. In William Patry’s latest book, “How to Fix Copyright,” he goes into the sad history of film archiving: Hollywood doesn’t even own copies of many of the films it has produced, and the distended term length has made it difficult to be certain of the legality of preservation efforts by archives and the like. The Library of Congress initially refused to collect samples, because the film was printed on highly flammable nitrate film, but now holds copies of some 200,000 movies. But there is also difficult-to-find and rare footage spread across 1,750 archives. The failure to archive is real and frustrating. The article refers to one of the first films that was submitted for copyright protection, another of Edison’s films called “The Charge of the Light Brigade.” (Another non-surprise: it’s based on an earlier poem by Alfred, Lord Tennyson, and inspired a 1968 film by the same name.) It was apparently issued as an extra on the Region 2 DVD release of that 1968 film, but I can’t find it online.